Emory/CHOA investigators are testing whether microgravity conditions can enhance the generation of cardiac muscle cells from induced pluripotent stem cells. 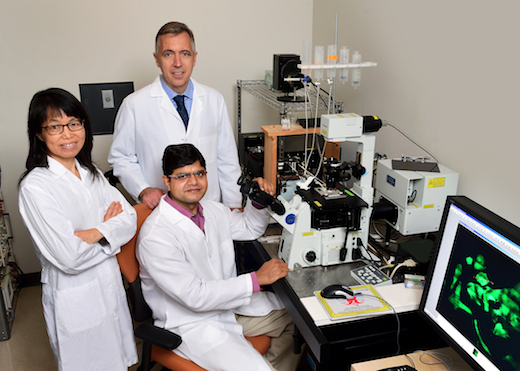 Shown: Chunhui Xu, PhD, Kevin Maher, MD and Rajneesh Jha, PhD. Photo by Jack Kearse. Researchers at Emory University School of Medicine and Children's Healthcare of Atlanta have been using space-simulation machines to enhance the ability of pluripotent stem cells to turn into cardiac muscle cells. Now they – or the cells they've carefully cultured, at least -- will get the chance to try the real thing on the International Space Station. Chunhui Xu, PhD, Kevin Maher, MD, Rajneesh Jha, PhD and colleagues have been awarded a two-year grant from the Center for the Advancement of Science in Space supporting their work. The project is titled "Generation of Cardiomyocytes from Human-Induced Pluripotent Stem Cell-Derived Cardiac Progenitors Expanded in Microgravity". Stem cell-derived cardiac muscle cells have been used to treat heart failure in animal models. They've also been used to study inherited cardiac diseases separately from the heart of the source patient. "We think that what we learn from the cells in space will help in optimizing the generation of clinically relevant cardiac muscle cells on earth," Xu says. Xu is associate professor of pediatrics at Emory University School of Medicine and part of Children's Heart Research and Outcomes Center within the Emory-Children's-Georgia Tech Pediatric Research Alliance. Xu is also part of the Wallace H. Coulter Department of Biomedical Engineering at Georgia Tech and Emory. Maher is director of pediatric cardiac intensive care at Children's Healthcare of Atlanta and associate professor of pediatrics at Emory University School of Medicine. On Earth, research associate Jha uses a "random positioning machine", which can provide a simulation of the microgravity conditions found in space. The machine periodically shifts cells so they never get used to one direction being down. With this machine, he and Xu showed they can produce cardiac muscle cells with five times the yield of conventional cell culture. The results were published in Scientific Reports in 2016. Human induced pluripotent stem cells (iPS cells) can be derived from adult skin or blood cells; iPS cell lines are commercially available. For the microgravity experiments, the cells will be loaded into automated incubator devices approved for use in spaceflight. The Center for the Advancement of Science in Space manages the International Space Station U.S. National Laboratory,.and was selected for this role by NASA in 2011.